Even if you brush, floss, and rinse twice a day, there are fine grooves and small pits on the surface of your teeth that are nearly impossible to reach with normal oral hygiene. In these grooves and pits, plaque is accumulated over time no matter how thorough your oral hygiene is. Obviously, if this plaque is left untreated in the grooves and pits of your teeth, you eventually have cavities develop. A great option for preventing this is to have your dentist apply sealant to the most vulnerable teeth. This coating of sealant will provide a smooth surface over the unseen and unreachable pits in your teeth. The smooth surface will make it quite difficult for any bacteria to begin developing cavities in your teeth. It also makes it much simpler for you to brush away the plaque with your daily brushing and rinsing. The most common place for this sealant to be applied is the chewing surfaces of difficult-to-reach back teeth. The sealant forms a strong bond with the surface of your teeth and becomes a protective shield over the enamel of your teeth. Even with the sealant, the patient should still brush his teeth regularly and thoroughly. The sealant simply provides another level of protection for vulnerable areas of your teeth. A great time to apply the sealant is during early childhood. Sealant can provide great long-term protection on permanent molars and premolars between the ages of six to fourteen years old when children are especially prone to cavities. Sealants may also be appropriate when a dentist notices baby teeth with hidden grooves or pits. Besides the aesthetic issues of baby teeth, these baby teeth also play an important role in holding the proper spacing for the permanent teeth of the future. This makes it crucial to keep these baby teeth healthy. You do not want these baby teeth to be lost too early. Thankfully, the use of sealants is a minor treatment that can be done quickly and with minimum discomfort. The tooth that will be treated is thoroughly cleaned and then dried. An acid solution is then applied to that tooth to rough it up for better bonding of the sealant. After the application of the acid solution, the tooth is again rinsed and dried. 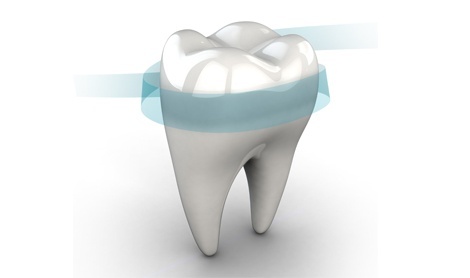 Lastly, the protective sealant is spread thoroughly onto the enamel of the tooth so that it can bond, seal, and harden. Normally, this sealant will provide protection for up to ten years.